Anyway, that was the best I could come up with --- I'm looking forward to seeing much better ideas from other more creative people. Used to use a trick with zip ties for spark plug wires. Keeps them neat and lined up. If you zip ties are small enough and you have a bunch. Last edited by Arbies on Thu Dec 26, 2013 2:06 pm, edited 1 time in total. That looks like a better option and easier to implement. WillAdams wrote: That looks like a better option and easier to implement. Is it me, or does anyone else find it ironic that we're cobbling together clips to hold wiring for a machine made to cut small parts? Though that is a pretty good quick solution to the wiring problem, I have to admit I'll try and put my money where my mouth is later! Yes, but it's the whole bootstrapping problem --- can't cut parts until the cables are run, can't use nicely cut parts to manage the cable until the machine is cutting parts. There are 4 shop-made link options on the wiki: http://www.shapeoko.com/wiki/index.php/ ... #Shop-made (we'd all be glad of more though). Im looking forward to seeing other better ideas from this next generation of machines. 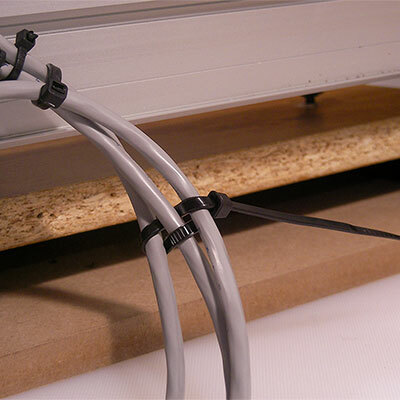 WillAdams wrote: Yes, but it's the whole bootstrapping problem --- can't cut parts until the cables are run, can't use nicely cut parts to manage the cable until the machine is cutting parts. the zip ties are braided around a set of cables to make them tidy. When woven together like this, the zips tie the wires together - while maintaining their independence. The RoadKill guys have shown this method for Spark plug wires, Just never thought about doing something like it on my CNC wiring. Good Tip.